The Makerbot Mars Base Challenge seeks designs for a Red Planet base that can withstand the harsh Martian elements, yet still feel like a home. When the first human settlers land on Mars, they'll be spending a lot of time indoors, and now you can design what that Martian base might be like with a new 3D printing contest. The 3D printer company MakerBot in Brooklyn, New York and NASA's Jet Propulsion Laboratory have teamed up to launch the MakerBot Mars Base Challenge. The 3D printing contest seeks innovative ideas for a habitat that could support a crew of astronauts on the surface of the Red Planet. That's where the MakerBot Mars Base Challenge comes in. A panel of experts from MakerBot and the Jet Propulsion Laboratory in Pasadena, California, will judge designs on their scientific feasibility, creativity and printability. Winners will be awarded MakerBot products, with the 1st-prize winner receiving a Replicator 2 Desktop 3D Printer. 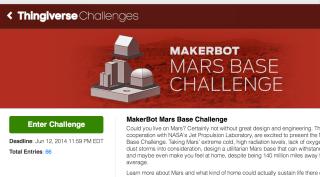 The MakerBot Mars Base Challenge is now open and accepting submissions until the end of the day on June 12. All entries must be uploaded to the Mars Base Challenge website Thingiverse.com, an open-source website for design ideas, with the hashtag #MakerBotMars. Winners will be awarded MakerBot products, with the 1st-prize winner receiving a Replicator 2 Desktop 3D Printer. As of June 5, there were 66 proposals submitted, many of them using some combination of dome-covered modules. "Taking Mars' extreme cold, high radiation levels, lack of oxygen, and frequent dust storms into consideration, design a utilitarian Mars base that can withstand the elements and maybe even make you feel at home, despite being 140 million miles away from Earth, on average," contest organizers wrote on the Thingiverse challenge website. Mars Base Challenge entries will be judged by a panel of experts from the Jet Propulsion Laboratory in Pasadena, California, as well from MakerBot. The designs will be rated for scientific feasibility, creativity and printability. The idea of using 3D printing to make extraterrestrial buildings isn't new. Scientists have been exploring the possibility of 3D printing with lunar dirt to create moon bases. Officials with the Mars Foundation are looking into how the technique could be used to 3D-print sustainable Martian houses out of raw material on the planet. NASA even plans to launch the first 3D printer in space later this year. That printer, called the 3D Printing in Zero G Experiment, was built by the company Made in Space to test the feasibility for 3D printing spare parts or tools on the International Space Station. NASA is also exploring the possibility of 3D-printed space food. Last year, the space agency awarded the Texas-based company Systems and Materials Research Consultancy $125,000 to begin studying the possibility of producing nutritious food with 3D printing technology that could sustain astronauts on long deep-space voyages.